Namebox Review 2019: Is Namebox a Good Hosting? Namebox.ro offers fast hosting solutions with fantastic customer support, especially for Romanian customers. They also provide services to help you get the most out of your hosting solution. Namebox.ro is a Romanian-based hosting provider that focuses on providing hosting solutions and domains to Romanian customers. They are a relatively new host with a modern and customer-orientated approach that tries to empower their customers with powerful website creation and hosting features. SSD Hosting: All products use SSD storage for increased performance. SEO Complete hosting: This hosting package is made specifically to help clients maximum traffic to their websites. Website cleanup or optimization: For a fee, ro can professionally create your entire website for you, optimize it for SEO and performance, or remove all viruses and monitor it for threats. SSL Certificates: Most plans come with free SSL certificates but you can also purchase certificates from top providers. Your experience using Namebox.ro can be as easy or as challenging as you want it to be. All hosting solutions already include a relevant hosting manager (such as cPanel). The technical support teams are there to help you with anything from transferring your domain to setting it up. You could also enlist their services to make your site more SEO-friendly or to do virus removal. The only downside is that you’ll have to wait for most of these services to be completed as they can take a few days. Web hosting: You can choose from four plans with limited and tiered storage, domains, and databases but with unlimited bandwidth. The most basic plan doesn’t include an SSL certificate. These plans are appropriate for anything from personal blogs to large online stores. WordPress hosting: Three hosting plans all include free SSL certificates, .ro domains, and unlimited traffic. Plans differ in the amount of storage, the number of websites, and whether a Dedicated IP is included. SEO Complete: The SEO complete hosting plan is billed yearly. VPS Servers: All these products use advanced hardware for maximum performance. Different plans have different amounts of RAM, guaranteed RAM as well as processing power. There are no free trials or plans. Unfortunately, Namebox.ro does not provide the most available support. Email support is 24/7 and phone lines are restricted to office hours from Monday-Friday EET. There is no live chat support. However, once support does get back to you, there is nothing to complain about. Email technical support responds quickly and helped me resolve an issue with my Magento server uptime promptly. The support staff is outstanding in how knowledgeable and helpful they are. 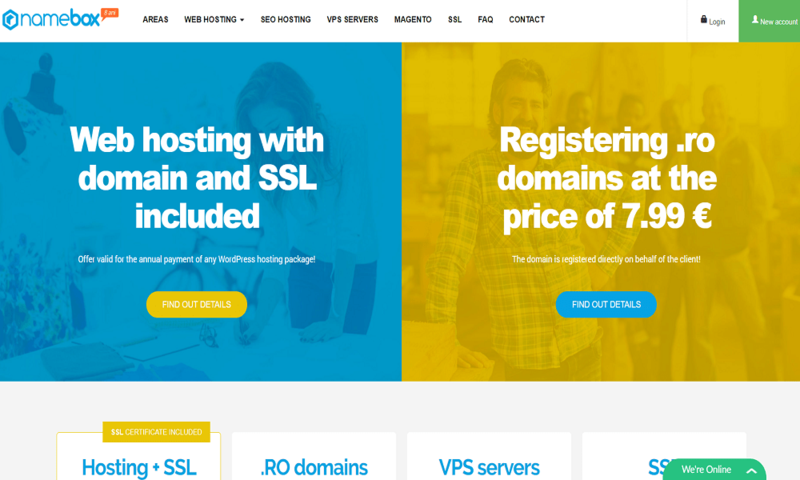 While not always the cheapest,Namebox.ro has a wider variety of attractive hosting solutions that are worth the money. Anyone in the world can transfer their domain to Namebox.ro and purchase one of their products. However, you may not experience the same level of support or performance. Wondering how Namebox stacks up against other Web Hosting companies? Enter any other Web Hosting company and we will give you a side-by-side comparison.